Sometime when she was thirteen, she toyed with a conundrum while working her first summer job: we’re making money from the environment, yet we’re destroying it. A young scientist exploring the ocean and all the wonders it holds, hoping to find a way to earn some money and, uncovers instead a way to unite the sea with the people around it. To say that is the precise moment her enthusiasm began would be a distortion of the truth, because it was innate. A Bahamian of both Irish and Bahamian descent, the soft sand, yellow elders and limitless cerulean sea always magnetized her. And that is how she has lived her life – channeling those things that captivate her and using them to educate those around her. YME student studying sand under the microscope. YME students conducting classroom experiments. YME students exploring the mangroves of the Bahamas. While molding and developing YME, Nikita completed a Master’s degree in Biodiversity, Wildlife, and Ecosystem Health from the University of Edinburgh in Scotland and a fellowship with the Zoological Society of London. At the former she focused on the main causes of environmental degradation in the Bahamas, one of which she discovered to be a lack of education about the importance of the marine environment. While her work with the Zoological Society of London targeted coral conservation, specifically the endangered pillar coral. She explained, “how I approach conservation is very people centered because I understand that you can’t just study the corals and try [to] solve the problem by the corals alone because the people really are the ones who are causing problems for the corals.” This understanding has contributed to her evolution as a scientist and a professional – she continued, “I figured I could train these groups of citizens on the different family islands to be able to monitor the health of coral reefs around their islands. With the idea that they monitor the health of these coral reefs, [and] that information they gather can then be compiled into an annual status of the reef report that can then be sent to policymakers and the managers as baseline information to monitor our natural resources, how healthy they are, and what the trends are.” The Natural History Museum of London discovered her efforts with her Youth Coral Conservation Team – a subset of YME – flew to the Bahamas for ten days in December, and compiled a documentary chronicling her conservation work. An extended version of the documentary will be released for World Oceans Day on June 8. 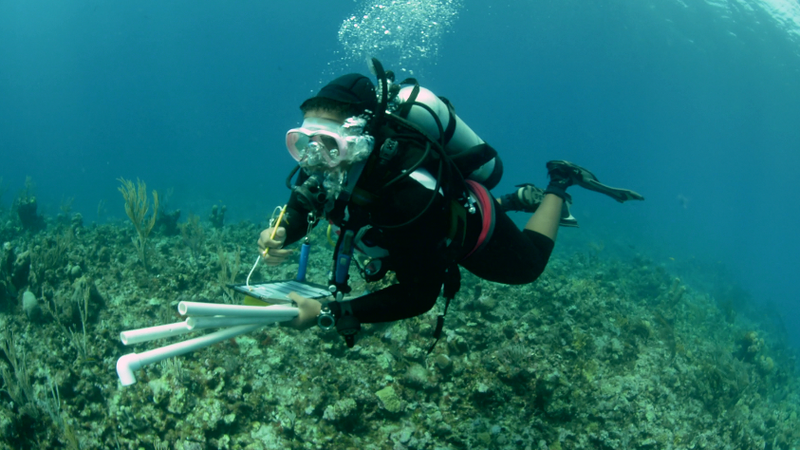 YME students monitoring coral reefs in The Bahamas. YME students frequently spend hours in the field. Here they celebrate after a recent dive. Shiel-Rolle monitoring coral reef health with YME students.